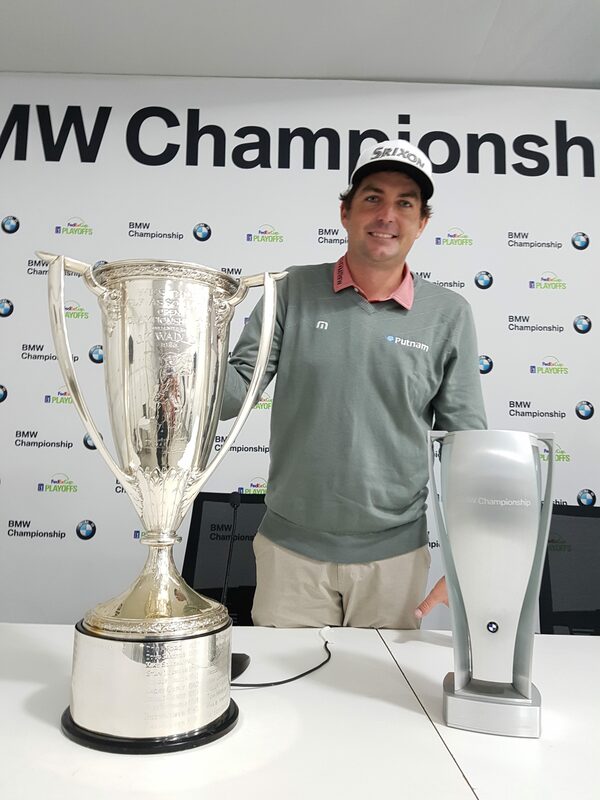 Keegan Bradley brilliantly ended a six-year winless drought with victory at the first extra play-off in the rain-affected BMW Championship in suburban Philadelphia. Bradley, 32 denied England’s Justin Rose, and who despite losing to his American rival becomes the new World No. 1. Bradley (64) and Rose (67) had completed regulation play tied at 20-under par on a very softened Aronimink course. The win is Bradley’s first since capturing the 2012 WGC – Bridgestone Invitational and the fifth Tour title of his professional career but a first since abandoning the controversial belly putter. Photo – @tourmiss“A lot has happened to me over these six years,” he said. “The belly putter was a tougher transition than I thought, and I kind of fell off the radar there for a little while so it’s been tough to go from being on Ryder Cup teams, being on Presidents Cup teams to not even — outside the top 100 in the world. “That was difficult. I had to really sit down with my coach Darren May, and we put a schedule together, and we worked hard to get back to this spot. “I felt so calm today. It was really, really kind of strange because I don’t normally look at leader-boards, but I looked all day, and I felt so solid. Bradley led by a shot playing the last but sent his second into a grandstand and then after a ‘free’ drop he took bogey only for Rose to birdie 17 and go one clear of his rival. But Rose then did the unimaginable in also bogeying the 72nd hole to send the event into a play-off and with Bradley winning with a tap-in par after Rose also sent his second play-off shot bouncing off the same grandstand and putting out for a bogey. “I’d love to go the Tour Championship winning because obviously I want to get to No. 1 by winning golf tournaments, but today was fun,” said Rose. Tiger Woods produced a closing 65 to share sixth place on 17-under par and with Woods next event, the September 20th starting Tour Championship in Atlanta. And Texan Jordan Spieth is staring at a likely $20,000 fine in failing to contest the minimum of 25 Tour events in a season. Spieth had not been expecting to miss out on the Tour Championship but he has in posting a last round 73 for a distant share BMW share of 55th place. The result saw the three-time Major winner drop to 31st and one place outside the leading 30 on the FedEx Cup points table who will tee-up in Atlanta. The Tour Championship was to be Spieth’s 24th and the Ryder Cup his 25th. “I assume it will either be a fine or I’m adding some events in the Fall,” said Spieth. “I don’t know if that counts. I’m not sure. I talked to the Tour a little while back and I didn’t really think much of it.